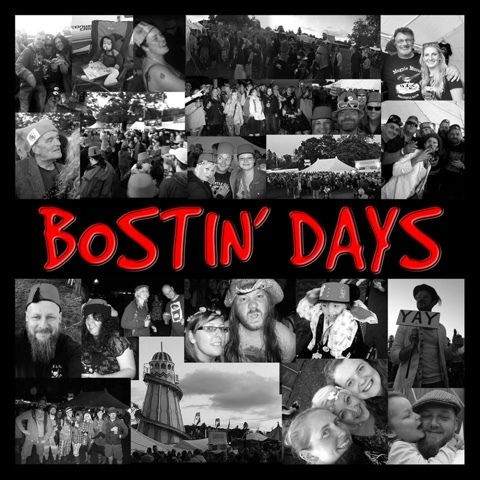 Bostin’ Days is a self produced charity album by a variety of artists who have come together in a common cause to support the Devon Air Ambulance. Alan Ewart checks it out for Louder Than War and reports on a project that hits the highest of heights. Each year in August some 20,000 people descend on Escot Park near Exeter in Devon for Beautiful Days Festival. Music fans and crew are united by a love of the Levellers, a unique festival atmosphere and the chance to enjoy great music with friends old and new. 2014 marked the 12th edition of one of the countries best festivals but as fans made their way home last year tragedy struck. As the festival site was being dismantled a crane with a Telehandler toppled over and the crane driver and a worker in the suspended cage sustained serious injuries as a result. The men were evacuated to hospital by the Devon Air Ambulance. Fans of the festival who subscribe to a Facebook chat group had already made a number of charitable efforts in the past and the group is known for the kindness people have shown to others since it was formed. On hearing about the accident members of the group wanted to raise funds for a charitable donation to the air ambulance. One member, Addie Burns, had a brainwave and a top-secret project was born. Rather than just asking for donations Addie felt that people may be more generous if they received something in return. Addie contacted a variety of bands and asked them to donate a cover of a Levellers song to be compiled into an album to be sold to fans to raise the funds for a donation. Bostin’ Days was born. Addie confesses that he had no idea as to the scale of the task he was taking on. However over 30 bands agreed to contribute to the project and over the next nine-months the recordings trickled in ready to be mastered into a coherent whole. The initial concept was for the finished album to be made available as a download but many people wanted a physical copy so it was decided that a 30 track double CD and a download would be made available and in recent weeks the concept finally came to fruition as CD’s were posted and download codes sent out to those who made a minimum £10 donation for the download and £15 for the CD. You might be forgiven for thinking that a project such as this would be variable in quality with engineering leaving a lot to be desired. You would be wrong! The bar is set extraordinarily high by the opening tracks on each disc. Renditions of “15 Years” by the Leylines and “Is This Art” by the Noses are nothing short of stunning. In many ways both bands were ideal to open the respective discs as both have something of the Levellers about them in terms of sound and attitude. Both bands make the songs totally their own and they lay down a marker for every band that follows. You would think that living up to such incredible heights would be a nearly impossible task. You would be both right and wrong. In this listeners humble opinion no-one actually surpasses the standard set in the opening tracks on each disc but by god do they match it. Here you have reimagined versions of 30 fantastic Levellers songs. Each track reinterpreted in a unique way. Every artist has played their chosen track in their own way, there are no attempts to sound like the Levellers. Every song has been courted, cherished, loved and and made into a whole that is remarkable in it’s consistency. It is incredible to think that each song was laid down in a different studio in a different part of the country because the entire piece is mastered so beautifully that it sounds as if they were all recorded by the same engineer. Every bands who contributed to this project and the Levellers themselves should be immensely proud of these songs. This is a brilliant collection of songs that have been treated with care and respect and turned into something truly wonderful. Of course I have my favourite tracks but I am not going to tell you which ones they are. They are my favourite tracks primarily because I either love the song for one reason or another or because I like the way it has been reinterpreted to bring something new out of songs that I have loved for a quarter of a century. You should get hold of a copy of Bostin’ Days and work out which are your favourites too. The one thing I will say is that no matter what you choose to pay for Bostin’ Days it will be cheap at the price and of course you will be helping out a great cause too. I applaud those who devised and brought the Bostin’ Days concept to fruition and I applaud those who gave their time to the engineering and mastering. Finally I applaud every artist who contributed their time and energy so very generously. The Leylines, Scott Doonican & Dan Booth, Stevie Simpson, The Folkestra, Emma & The Professor, Doozer McDooze, Greenman Rising, 3 Eyed Fox, The Bar-Steward Sons of Val Doonican (feat. Maartin Allcock, Eliza Carthy, Mike Harding & Graham Oliver), Star Botherers, Ferocious Dog, Maelor Hughes, Lukas Drinkwater & Hannah Wood, Son Primo, Gaz Brookfield, Brad Dear, Leatherat, Funke & The Two Tone Baby, Hobo Jones & The Junkyard Dogs, Pete Jackson & Lynn Holt, Parsons Lot, The Fanzines, The Sweetchunks Band, Davey Malone & The Longtails, Scott Doonican, Bleedin’ Noses, Shanks Pony, Bleeding Hearts, Folk The System, The Travelling Dangleberries. As an addition to the project the majority of those playing on the album are gathering for a day of fun at the Queens Hall, Nuneaton on October 17th for Bostin’ Days Live. Tickets are £24.75 and a very limited number are still available here. 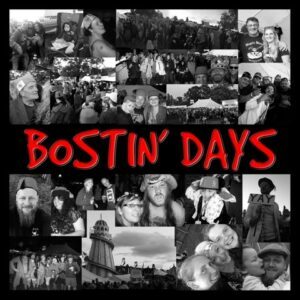 Bostin’ Days is available for a charitable donation here: The project also has a Facebook page.